You can thank the Germans for the fantastic coffee produced in Chiapas, Mexico and we soon saw why when we visited Finca Hamburgo and Finca Argovia along the Ruta del Cafe. Coffee on the bush in Chiapas, Mexico. The red beans are nearly ripe. More than 100 years ago the Mexican government sent out a call for help to Germany saying it would welcome immigrants willing to develop and then work coffee growing and processing plantations in the highlands of Chiapas which had been identified as prime coffee growing terrain. At the time, every harvested coffee bean (then referred to as “green gold”) in the world passed through the port in Hamburg, Germany before being distributed around the world so reaching out to Germany for help made sense. 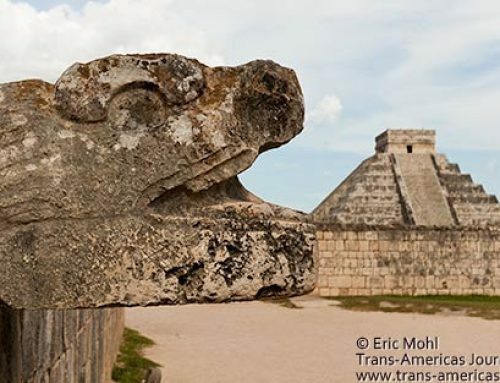 Many German families answered the call and moved to Mexico. The beneficio (processing plant) at Finca Hamburgo, one of many coffee plantations in Chiapas. Then came WWII and deep suspicion of Germans which eventually lead to deportations and land reclamation that saw some German families in Mexico lose it all. When they were able to return to Mexico many were asked to buy back their own land. 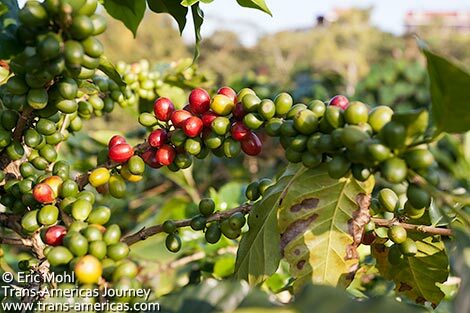 Today, coffee is flourishing in Chiapas and the state produces outstanding coffee (not that we like Starbucks, but the mega chain gets a chunk of its supply of coffee from Chiapas). There are up to 400 million coffee plants producing here and many coffee fincas (farms) are still run by descendants of the original pioneering German families. A few of them have expanded their plantations to also offer tours, boutique hotels, and innovative new eco farming practices. Two of these fincas lie above the town of Tapachula in the highlands of Soconusco, Chiapas–an area referred to as the Ruta del Cafe. Finca Hamburgo was founded in 1888 by Arthur Erich Edelmann from Perleberg, Germany and his wife Doris Mertens. Like all of the coffee pioneers in Mexico, the Edelmann family had to plant thousands of coffee plants on incredibly steep hillsides and build facilities for the processing of coffee (they put in the first flying fox in Mexico) and run it all using power from their own hydroelectric plant. Finca Hamburgo is still run by descendants of Arthur Erich Edelmann, but a few other things have changed since 1888, as we found out when we were invited to visit. But first we had to get there. 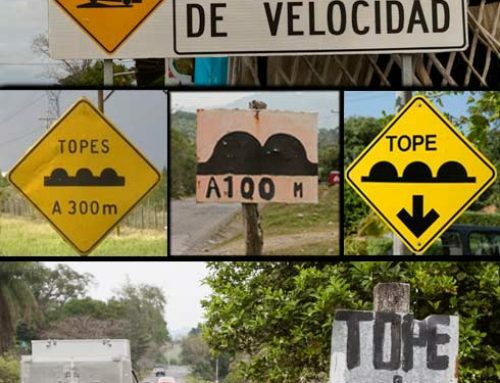 Though it’s just a few dozen miles from the town of Tapachula, the journey up into the coffee growing region takes at least an hour on a well-worn dirt road (no rental cars, please). Still, it’s an easier journey today than back in the late 1800s when the fincas were established. 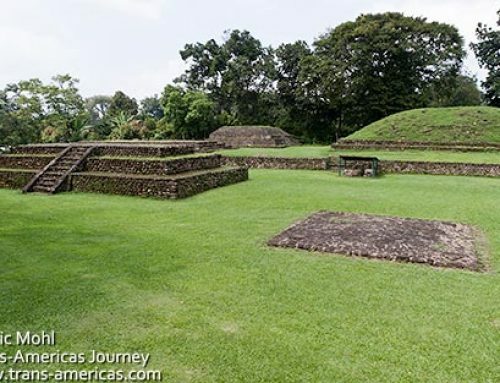 At that time it took three days to get from Tapachula to the plantations. Once we reached Finca Hamburgo at 4,100 feet (1,249 meters) we were rewarded with cooler temperatures and views of Volcan Tacaná (the highest point in Central America at 13,320 feet / 4,060 meters) on the border between Mexico and Guatemala. On a very, very clear day it’s also possible to see the Chiapas coastline from here. 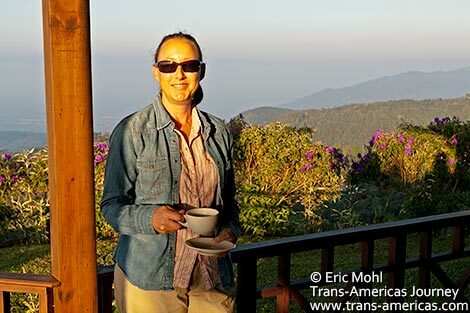 Karen enjoying a sunrise cup of coffee grown on site and delivered to our door at Finca Hamburgo. 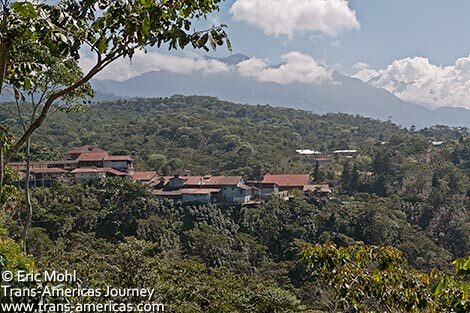 Finca Hamburgo continues as a working coffee plantation (one of the largest) but it’s now also in the tourism business offering six rooms and two suites, all with deep wrap-around porches which are perfect for enjoying those views and your morning coffee. The hotel looks and feels a bit like two big Cape Codders plunked down on a ridge in Chiapas. There’s also a restaurant where you can get German beer. 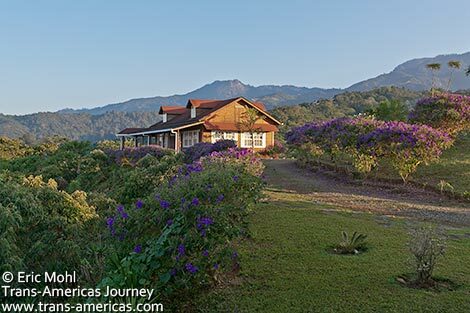 The Cape Cod-esque guest rooms at Finca Hamburgo in Chiapas, Mexico. More rustic but incredibly atmospheric rooms (tile floors, patios, heavy wood beams) are sometimes available at Finca San Francisco, the operation’s flower farm where exotic flowers are grown in huge hothouses before being washed, trimmed, and meticulously packed (sometimes shrink-wrapped) to be shipped to big floral companies overseas. Finca Hamburgo has also turned part of its original processing plant (called a beneficio) into a museum.It’s full of photos and tools and other artifacts from the plantation’s early days in the late 1800s, including what’s left of its ground-breaking flying fox. 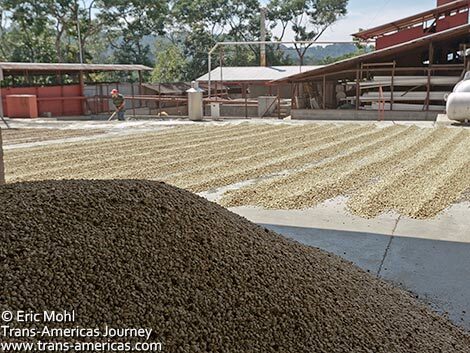 Coffee beans drying in the sun at Finca Argovia. An even better example of how to take coffee history forward with insight and innovation is Finca Argovia, down the hill from Finca Hamburgo on the way back down toward Tapachula. 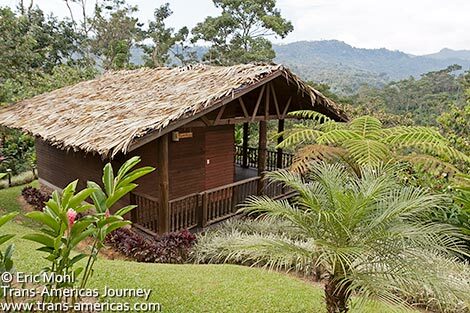 Sure there’s a resort hotel at Finca Argovia and it’s a member of the prestigious Mexico Boutique Hotels group offering a lovely collection of beautiful wooden cabins, rooms, suites, and bungalows in the jungle. All of them are well-appointed, stylish, peaceful and really impart a sense of place. Our cabin at Finca Argovia. There are no TVs or phones but there are fresh cut flowers (more on those in a minute) and fun golf carts to shuttle you around the cobble stone paths back to the main building and the restaurant where staff are trained for days in the art of brewing the perfect cup of coffee. 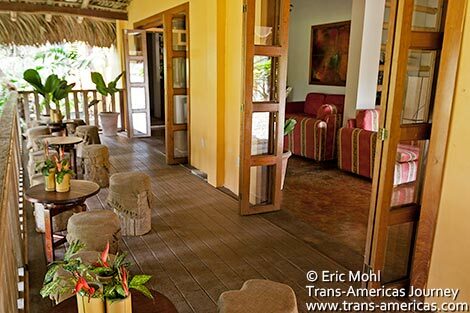 The cafe/bar area at Finca Argovia. The welcome “cocktail” is a petite scoop of homemade coffee ice cream and when we were there a new pool, spa and luxury tent accommodation were all in the works. We already want to go back and check it out. But the hotel, spa, and restaurant are just part of the vision of Bruno Geismann, the fourth generation of his family to run Finca Argovia. His overall goal is to be totally self-sufficient economically and totally sustainable agriculturally. Bruno, an imposing combination of German physique and Mexican mannerisms, believes diversification is the best way to offset the vagaries of coffee prices which can spike and drop drastically. Bruno poses a convincing argument that coffee really should be about US$200 a pound in the supermarket based on the cost of producing it and the amount many people are willing to spend on a cup of coffee (Starbucks, again). Relax. Bruno doesn’t actually propose that we should all pay US$200 a pound–just that US$8 or US$11 per pound is clearly too little. In addition, he insists that Fair Trade coffee movements have done little to trickle retail level coffee profits down to the actual coffee growers who still get pennies per pound. 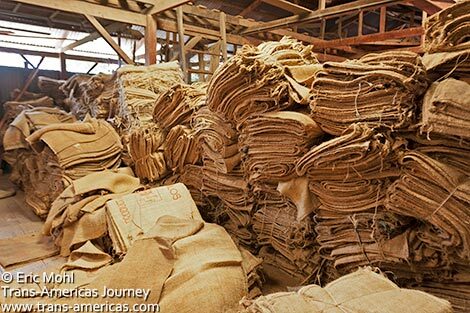 We were surprised to learn that burlap sacks used to pack and ship coffee beans are one of the priciest items in the production of coffee. Bruno’s growing success with a combination of working coffee plantation, luxurious lodge/spa/restaurant and eco-agro flower business is radical thinking and a radical investment in the coffee business where profit margins are often pennies. It’s also the best way for Bruno to prove that his green leanings are also good business. As a visitor you can tour Bruno’s labors on a two hour sunrise hike up through his jungle-shaded coffee plants to a lovely view point for views of Volcan Tacaná (with a thermos of fresh coffee, of course) or sign up for coffee processing and flower production tours which Bruno was kind enough to lead us on. 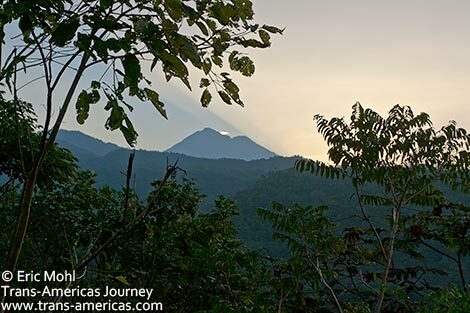 Sunrise behind Guatemala’s Volcan Tacaná–the highest point in Central America–as seen from the hilltop view point at Finca Argovia in Chiapas, Mexico. Bruno is a passionate eco-agriculturist and very proud of the fact that his coffee is organically grown and that his processing is done using hydroelectric energy generated at the finca. 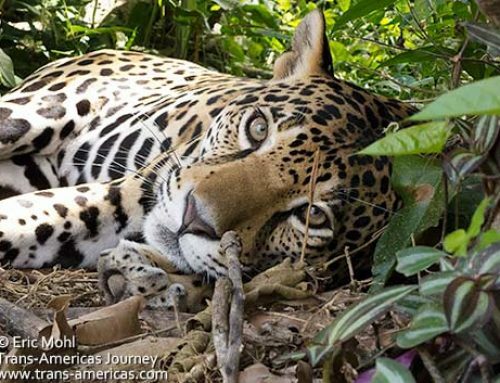 His processing also uses a minimum of water and what is used to clean, de-hull, and ferment the coffee beans is treated at an on-site residual water treatment plant–the only one of its kind in Mexico–before being returned to the gorgeous rivers on his property. The discarded coffee hulls, usually a waste product of coffee processing, are used as compost at Finca Argovia. 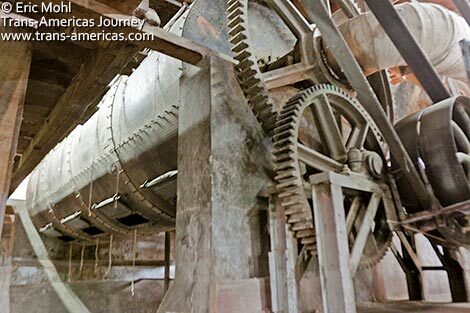 This massive coffee dryer at Finca Argovia is well over than 50 years old and still going strong. Even Bruno’s machinery is recycled, sort of. Most of it is original to the 100+ year old business and it’s still chugging along. With so much land and such a need to diversify his business, Bruno quickly saw the potential in growing ornamental tropical flowers. 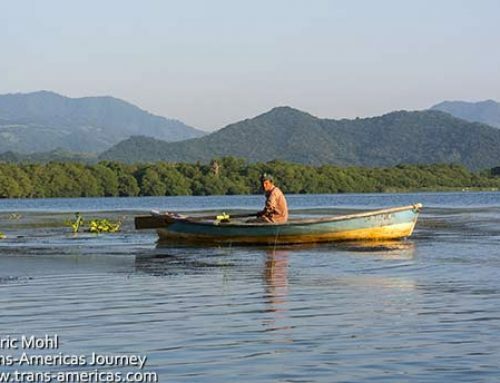 Today he has devoted many acres to growing haliconias, orchids, ginger blossoms, and other exotics for which he gets around 10 pesos (less than US$1) per stem. Anyone reading this in North America or Europe knows that each stem of these coveted flowers goes for many dollars apiece through your local florist or online flower seller. Part of the labor-intensive process of harvesting, washing and packing the organically grown exotic flowers at Finca Argovia. 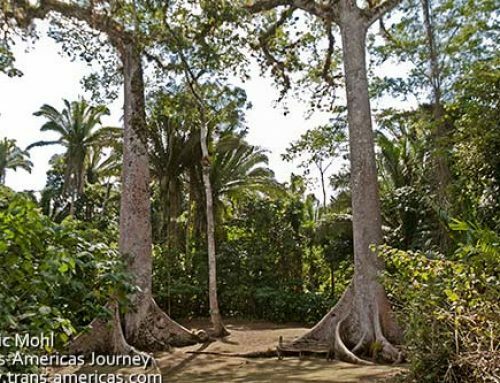 Finca Argovia also works to protect and enrich soil, preserve indigenous forests and keep trees along all streams and rivers to conserve water. Bruno says his eco approach is not making him rich, but he is able to turn a small profit more easily since his fortunes are not completely tied to the traditional coffee market. The results are delicious too. 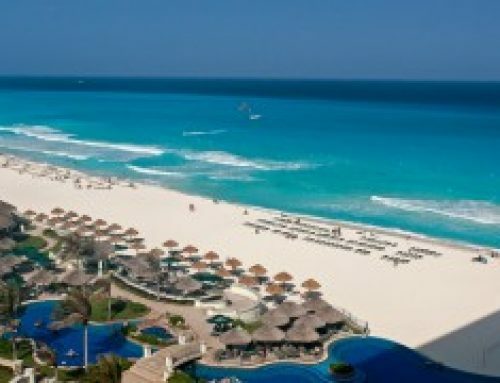 Finca Argovia’s small-batch organic coffee is sold around the world and served in some very fine restaurants, including the restaurant at the celeb-favorite five-star hotel Maroma on Mexico’s Riviera Maya. Haliconia flowers ready for packing and shipping to floral companies around the world. Finca Argovia is profiting in other ways too. Our cabin (like all of them) was right in the middle of the jungle but there were almost no mosquitoes. We could sit on the gorgeous porch at dusk and not get bitten. Incredible. This is, according to Bruno, because the environment at Finca Argovia is finally back in balance. species and the rare resplendent quetzal has also been spotted nearby. 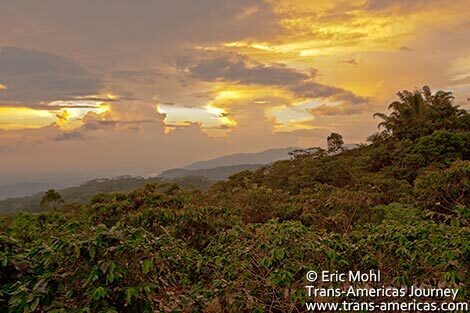 Sunset over hillsides covered in coffee bushes in Chiapas, Mexico. Very informative – and though I have been to Chiapas, I didn’t know anything about the history of the connection between coffee and German immigrants. I am surprised at the opinion that Fair Trade has not helped local coffee growers. I’d like to know more about how that works locally in Chiapas. And what is a flying fox? David, Good question. We’re no experts on the coffee markets–just trying to convey the interesting argument Bruno Geismann (the owner of Finca Argovia) put forth during our very interesting conversations with him at the finca. My understanding is that Fair Trade regulations help the small time farmer who is growing some coffee on his property. That farmer sells his coffee to a larger finca/beneficio which dehusks, ferments and dries the coffee beans and then sells them on the wholesale market. I assume ‘fair trade’ is assuring that the small time farmer is getting a “reasonable” price for his efforts from the larger finca, but does little to help the larger finca get a fair price from the overall market, despite the fact that many consumers are willing to pay a higher price for coffee labeled “fair trade” which, according to wiki, amounted to ONLY 0.51% of the entire market in 2005. Finca Argovia is a mid-sized coffee plantation that produces organic coffee which also sells at a premium. But because Bruno’s finca is not served by the Fair Trade regulations, he sees very little of the price paid for his organic coffee. 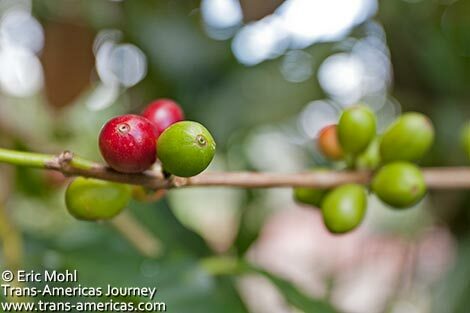 In addition, coffee is a farmed product that takes a lot of labor and energy to produce. 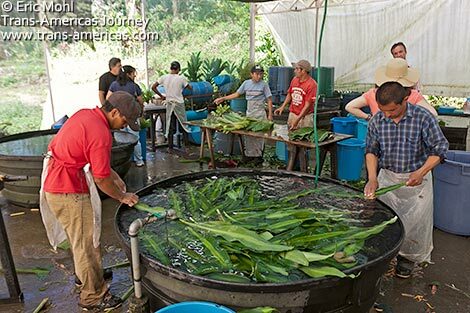 Generally all farmers throughout the world rarely see a payback commiserate with the effort and risk they take to produce their crops. To compound this issue, coffee is a commodity (like crude oil, gold, pork bellies, soybeans…), meaning it is traded throughout the world at a price set by traders sitting in front of computers in financial houses and on the commodities trading floor in NYC. This means that the price of coffee is set by supply and demand by people who have no idea the amount of effort and investment it takes to produce quality coffee. Coffee prices on the commodity exchange reached a several-decade high this year (breaking $3 per pound last month), but over the past 40 years the price has averaged less than $1.20 per pound. In the past decade it’s rarely broken $1.50 per pound and not much of that is going to the coffee farmer. If you get your cappuccino at Starbucks you’re you’re paying the equivalent of around $200 per pound for coffee beans — 50+ cappuccino per pound of coffee x $4.00. When quality coffee producers like Brunos and many others have trouble paying the bills while millions of people pay $4 for a cup of coffee it’s clear that very little is trickling down and it’s the middle-men and retailers who are making the most profit. We’ll ask Bruno to chime in here from his perspective. Thank you for this information. I wonder whether the percentage of coffee that is fair-trade is much greater now than it was in 2005? I try to do my bit when I am in the supermarket – and there is no downside because the coffee is good. I do the same with tea. I think many, many people in England, for example, know which way the wind is blowing and will try to buy fair-trade, but it’s the issues behind the scenes that are difficult to understand. As you say, it is a complicated issue. “With the Fair Trade comment, it needs to be put in the right context, because actually farmers do get a better price through this mechanism, which has its purpose and benefit, but it does not go all the way as its name suggests. I believe that a lot more effort needs to be put in into getting a higher income towards the farmer, so that the decision at the end of the day might not be something like: I shall better change from coffee towards corn, (which many times is the case) or, let’s go north, or many other options which go against conservation or community growth. The intention of telling that it has not helped, is exactly that, we need to provide awareness. 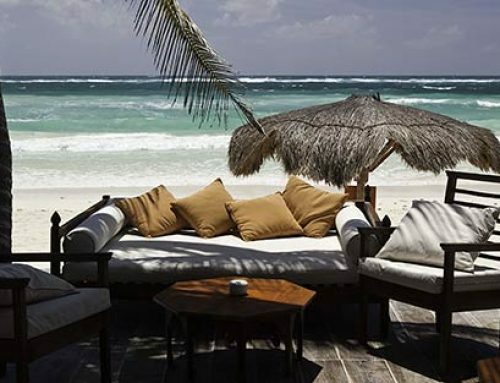 Your cabin looks like heaven- would love to spend some time in this area of Mexico. I’ve only been to more tourist areas. Sounds like a coffee lover’s dream to stay in. Those cabins also seem like a find! I can’t get over how huge that coffee dryer is. 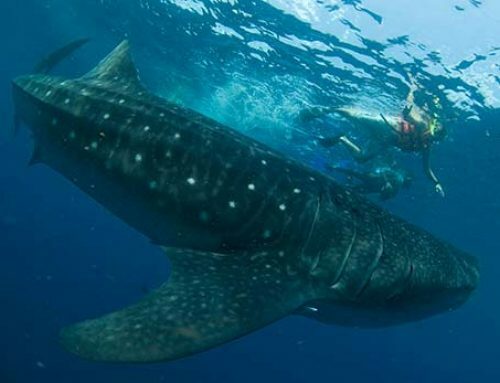 I will definitely follow this itinerary if I make it to Chiapas. 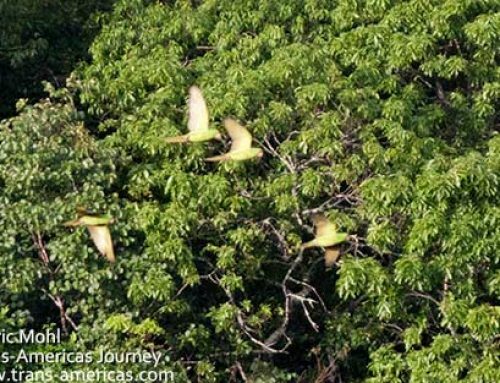 Very interesting post and good to hear that the quetzal has been spotted in the forest near the fincas. 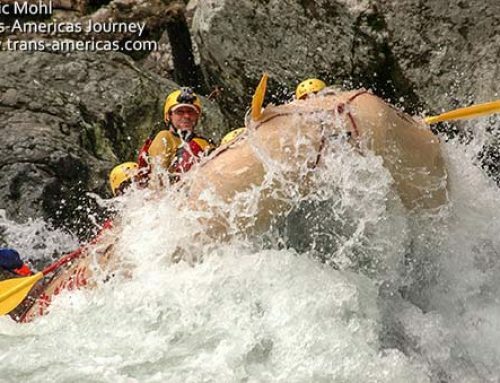 Look forward to exploring this part of Chiapas. Wow, that’s great! I love this place awesome, I’m perfect to this place because I’m a coffee addict I use to have coffee every time I’m bored and reading books too.